A vandalized shed near the Marion County field house had not been repainted before the football game against South Pittsburg on Friday. Offensive language has been blurred in this photo. A heated cross-county high school football rivalry took an ugly turn as vandals defaced the fieldhouse at Marion County High School. South Pittsburg made the short trip to the Jasper school Friday night in one of the state's oldest rivalries for a game to decide the District 6-A championship. Both teams are state-ranked and have proud traditions. 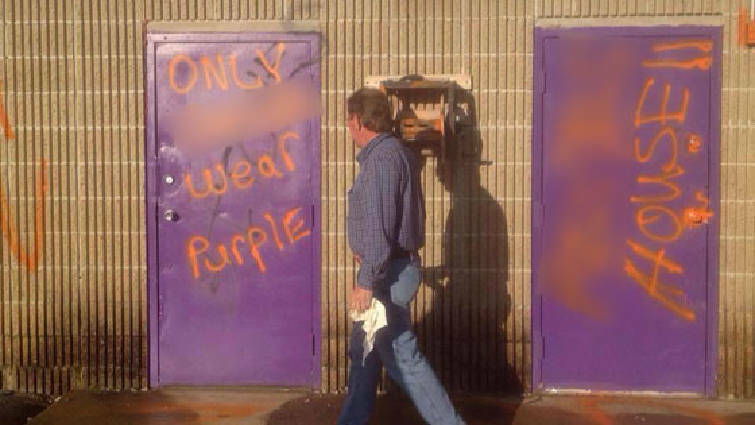 But during the wee hours of Friday morning, orange and black spray paint was used to write vulgarities on the side doors and along the back side of the fieldhouse as well as a storage building. "It's several thousand dollars worth of damage," said Marion County school superintendent Mark Griffith said during the day. "It's sad that somebody would take a rivalry too far like this. We'll get it cleaned up, but with the game coming up in just a few hours, our main concern right now is to get it covered up before the public arrives and sees it, because its language and images are really embarrassing. "Once we find out who it was, we will prosecute them to the fullest extent of the law." According to Griffith and MCHS principal Larry Ziegler, there are surveillance cameras in place at the fieldhouse and they are working with local police to investigate. Trusties from the Marion County jail were on campus to begin the cleanup process Friday morning. "It's extremely disturbing and disappointing to me and our school, because that is not something we condone at all," South Pittsburg principal Danny Wilson said. "Our senior captains came to me and asked if they could go up there and help clean it up because they're as embarrassed as I am and they don't want people thinking we allow thugs like that in our school. "We warned all of our kids at school yesterday to stay out of Jasper, and I hope they can identify who it was, because if it was any of our kids we will drop the full hammer on them."